Private labels key element of this strategy. Toonz Retail has announced that it will leverage the opportunities in the kidswear segment via its own brands in tier-II and-III towns. 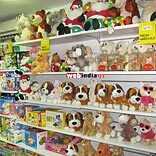 As part of this strategy, this retailer has recently introduced WowMom and SuperYoung for children up to the age of 12 years. Toonz Retail has 45 outlets on a pan India basis and plans to add five more stores, shortly.